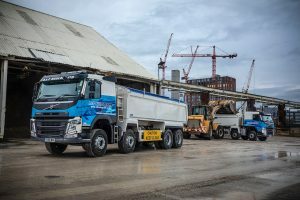 Construction and aggregates supplier Bolton’s A&F Haulage is modernising its fleet of over 100 trucks, as well as supplementing it with a smaller vehicle to facilitate a new contract. As a consequence it has bolstered its fleet with an order for six new Volvos: five FM11.410 8x4s and an 18-tonne FE8.320 4×2. Supplied by Thomas Hardie Commercials, the FM rigids include an X-high chassis height with B-ride and sleeper cab. Powered by Volvo’s D8K Euro 6 engine producing 410hp, they also come with a 12-speed, I-Shift automated mechanical gearbox. A&F Haulage also chose front axles with extra high ground clearance and rear single reduction tandem axles with a maximum bogie load of 23 tonnes. The FE rigid has a standard frame height and a D8K320 six cylinder engine developing 320hp, which drives a 12-speed I-Shift. A&F works for customers like Cemex, Hanson and Tarmac, shifting asphalt and aggregate. Masood added: “It’s not so much in and out of quarries, as soft work from city to city. The FMs have a high cab in order to have good ground clearance for the odd occasion when they’re going off-road and we chose sleeper cabs so that there’s more room and storage for the drivers. We have always operated Volvos, since the early stages of the company. It’s all about the product and the reliability: it’s a great all-round vehicle”.